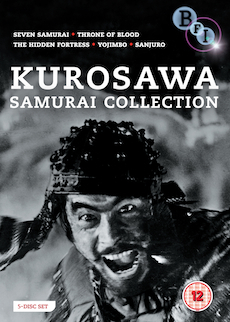 Contains Seven Samurai, The Hidden Fortress, Yojimbo and Throne of Blood. The films of Akira Kurosawa, one of cinema's greatest auteurs, have had a profound effect on audiences around the world, and his acclaimed samurai epics – featuring international star Toshiro Mifune – have inspired filmmakers as diverse as George Lucas and Sergio Leone. When the residents of a small Japanese village seek protection they hire seven unemployed ronin (masterless samurai). Paid only in handfuls of rice, the samurai remain distant from the villagers, knowing that their assignment may prove to be fatal. Unanimously hailed as one of cinema's greatest masterpieces, Seven Samurai has inspired countless films, including The Magnificent Seven. In this brilliant reimagining of Shakespeare's Macbeth Toshiro Mifune plays a samurai fated to betray his friend and master in exchange for the prestige of nobility. Kurosawa's bloody tale is a triumph of economic style, and the climactic battle scene is full of remarkable, and brutal, imagery. In this classic collaboration between Kurosawa and star Mifune, a warrior and a princess try against all odds to return to their homeland with their fortune. Acknowledged by George Lucas as the inspiration for Star Wars, The Hidden Fortress combines an epic tale of struggle and honour with modern comic sensibilitiesto masterful effect. Adrifting samurai for hire plays both ends against the middle with two warring factions, surviving on his wits and his ability to outrun his own bad luck. Eventually the samurai seeks to eliminate both sides for his own gain and to define his own sense of honour. Yojimbo provided inspiration for A Fistful of Dollars.